The first date of the world's most powerful couple. 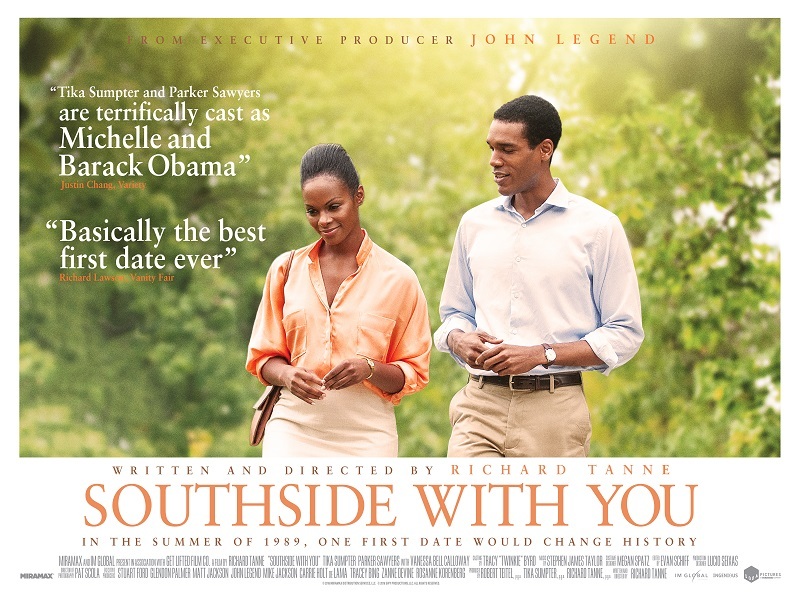 Enthusiasm for Southside with You is likely a fraction of what it might have generated had it been released in 2008, but if you can approach Richard Tanne's film with an open mind, you'll find it a sweet, simply told story of two young, well intentioned people making a connection. On a balmy Chicago summer day in 1989, a young lawyer, Michelle Robinson (Tika Sumpter), spends her day, against her better judgement, with the handsome, charismatic young man (Parker Sawyer) spending his summer serving as an associate at her law firm. His name is Barack Obama. One of the big disparities between Americans and Europeans is how we view our politicians. In Europe, we assume the worst of anyone entering the world of politics - in our eyes, they're guilty until proven innocent. In the U.S., citizens are far more trusting of their leaders, some even revere them. Outside of North Korea, it's hard to imagine any other nation but the U.S. producing a romantic drama whose protagonists are the current serving leader of the nation and his other half. Obama was different though. Was. Straw polls taken eight years ago showed that most Europeans would like him as the leader of their own country. Now, rightly or wrongly, he's seen by most as just another in a long line of war-mongering megalomaniacs. 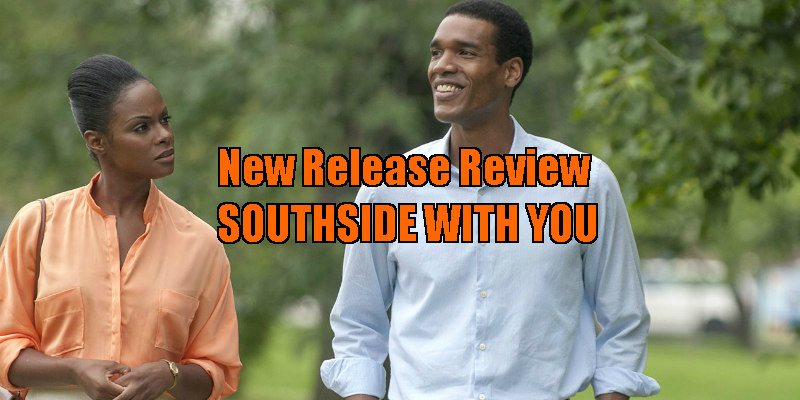 Enthusiasm for Southside with You is likely a fraction of what it might have generated had it been released in 2008, but if you can approach Richard Tanne's film with an open mind, you'll find it a sweet, simply told story of two young, well intentioned people making a connection. Sumpter and Sawyers are ideally cast here. Both are fantastic, but it's the former who is given the heavy lifting. It's her character who goes on a journey here, starting out as an uptight middle class girl who views her rough around the edges would be seducer with suspicion. "Why?" is the single word question she asks throughout in response to Barack's confessions and anecdotes, initially with scorn and derision, finally with affection by the time the two are sharing an ice cream cone at the evening's end. Through a day of stolen glances and growing admiration, we come to view these two young people as destined to come together. For a movie that's outwardly about race, Southside with You is that rare American movie that acknowledges class. When Obama takes Michelle to a working class church, she's more uncomfortable in her surroundings than if she were dining at a country club. This scene forms the highlight of the film, though not for the sycophantic reasons its creators undoubtedly intended. As Obama delivers a compelling speech to a disgruntled crowd who need to build a community centre to keep their kids safe, it's impossible not to imagine there's a similar real life meeting currently being held in a mosque somewhere in the Middle East by families affected by his later actions as President. Sawyers' words are very much of the "Yes we can!" era Obama, but the hint of a tear in his eye suggests he knows ultimately we'll all be sorry we couldn't. Southside with You is in cinemas September 30th.